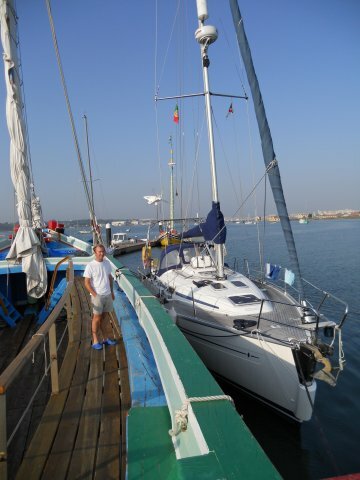 We returned to Cascais to anchor, as Rob & Rhian had returned from the UK before setting sail for Madeira, en-route to the Canaries to start the ARC. 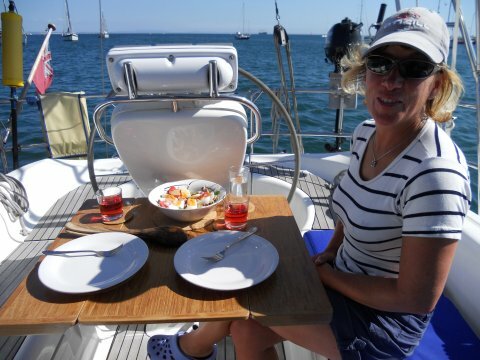 We had a lovely evening aboard Beyzano, enjoying their company and a delicious chicken curry, before rowing the dinghy back out to the anchorage - quite some way! We wish them a safe passage to Rodney Bay, as we do to all the other people we know taking part in the ARC, including Pipit's former owners, and will follow their progress online. 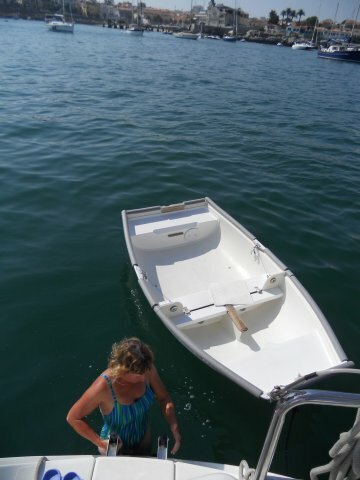 We spent a few more days at anchor, as the weather was beautiful, and for the first time swam from the back of Pipit in order to cool off - something we've not done since chartering in the Ionian 3 years ago! The anchorage was busy as it was the weekend, but in an interesting way rather than a crowded way. 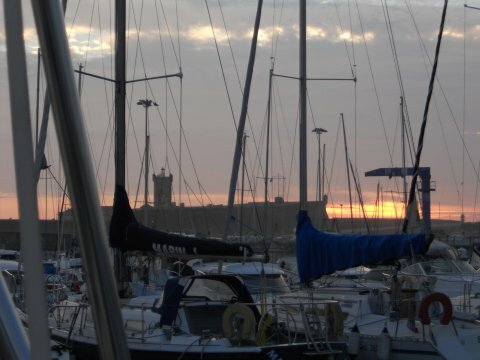 It seems that people who have yachts and motor boats in the various marinas in Lisbon and Oeiras enjoy a short hop down to Cascais to anchor of a weekend - and who can blame them? 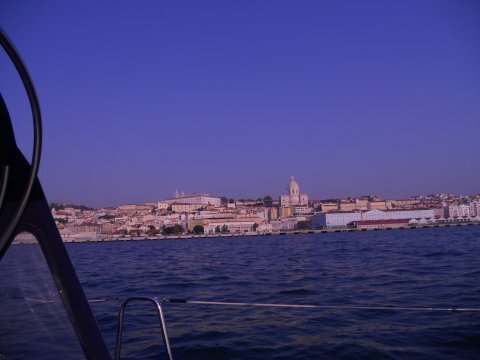 As there was no sign of the processor board for the plotter, we decided to go right up the Tagus to Seixal and anchor for a few days. 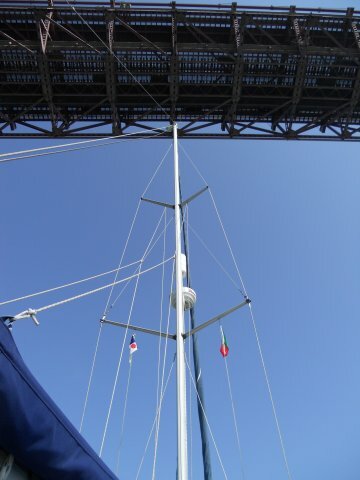 We had a pleasant motor and sail, passing under the Ponte 25 de Abril at Lisbon. The noise of the traffic on the bridge as we passed beneath was unbelievable - there is no tarmac on some of the lanes, just a metal grid, so the tyre roar was incredibly loud. There is a marina under the bridge, though why you'd want to keep a boat there I don't know. I SAID WHY YOU'D... When we got to Seixal, there was much less space to anchor than we'd been led to believe in the pilot guide - most of the anchorage seemed to be full of private moorings. Also the channel was not clearly marked, and we gently ploughed a small furrow in the soft mud for a few feet, on a rising tide... After failing to get the anchor to set for the 5th or 6th time in the one available spot, we gave up and rafted alongside a traditional boat tied to a walk-ashore pontoon (new and so not mentioned in the pilot guide) - no power or water, but FOC - hurrah! Busman's holiday - a former power station, now an electricity museum. 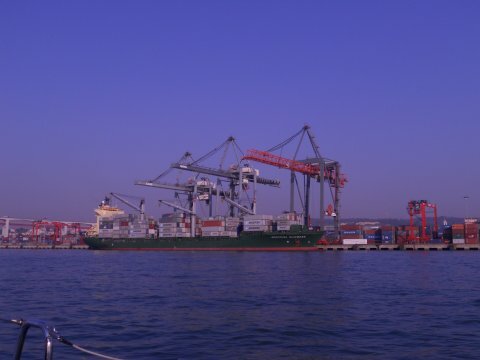 In the channel to Seixal. Our berth for a few nights at Seixal. 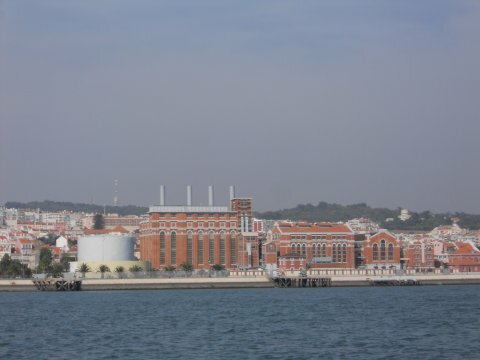 We stayed a few nights at Seixal as it was a peaceful spot, with distant views to Lisbon. As we needed water, and there was word that the plotter processor board was on its way, we went to another marina, this time almost as far up the Tagus as we could navigate to Marina Parque das Nacoes, part of the Expo 98 complex. Our immediate impression of this was that if we had to over-winter here, it wouldn't be a disaster. If anyone had told us at the beginning of this season that we would consider overwintering in a capital city, we wouldn't have believed them. Parque das Nacoes is a somewhat artificial place, having been built in its entirety for Expo 98, that wouldn't normally appeal to us, but it's actually quite nice and surprisingly quiet and peaceful. 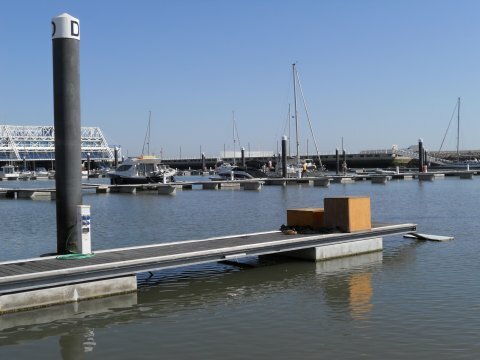 The marina itself is excellent, with very good pontoons, the showers are hot, high pressure and in a small building actually on the pontoons, the staff are friendly and very helpful, and the vista from the pontoons is really quite pleasant. 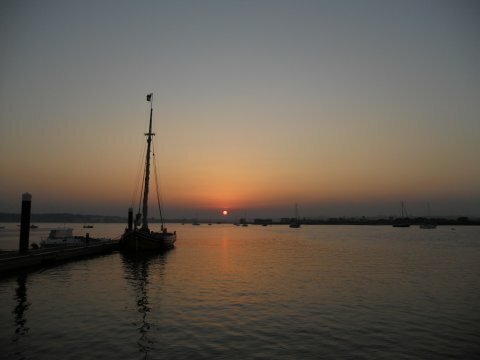 The marina is quiet, a heron (Harry) came to visit each evening and even a kingfisher perched on a mooring line briefly. Yet a short (well 15 minutes) walk away is an enormous shopping mall (think Cribbs Causeway x 2) with an equally enormous supermarket, so we really would be well catered for if we did over-winter there. And to make us feel at home, there were even ducks in the marina, though unlike at La Roche-Bernard, they have their own house on their own pontoon (D obviously) and seemed not to s**t all over the pontoons... People in the marina were friendly - we were admiring some teak restoration on an older Bavaria just down the pontoon from us one day when the owners arrived, and before you could say "Bom Dia", we were invited on board to have a look! Sunset at Marina Parque das Nacoes. The call came to say the processor board had arrived, and an engineer duly arrived to take the plotter away to fit it. He returned a few hours later with a fully working plotter - excellent. Not quite so excellent was that after he'd gone, we noticed a scratch on the glass that wasn't there before. Another call and it was agreed that another engineer would return to have a look. The next day the excellent Carlos arrived and agreed with Andy's suggestion that the scratch matched the curve of the compass housing, that the previous engineer (as it turns out the boss...) had rested the plotter against. He took it away to replace the glass which, thankfully, was in stock. Marinas along the Algarve tend to be in artificial holiday complex type environments, but on the plus side, there would certainly be more of a liveaboard community, the one in Lagos for example is reputedly extremely good. So we narrowed our choice of possibilities in order of likeliness to Albufeira, Portimao and Lagos, but not wanting to commit without actually seeing them, last Friday we hired a car in Lisbon and drove firstly to Albufeira. This was the best €59 we have spent in a long time; as Carlos later said, "Albufeira is a hole" - now Carlos's English is perfect, so I don't think anything was lost in translation! Suffice to say it was not our cup of tea, the bars & cafes surrounding the marina having pictures of 'Ye All Day English Breakfast' outside - told us everything we needed to know really... The winter weather on the Algarve is noteably warmer and drier than Lisbon, but in Albufeira it would be of no consequence as we'd not even want to look outside, let alone go outside. Ok so perhaps it's not that bad, but you get my drift. So we moved on to Portimao, which was an improvement, but in the middle of nowhere, with nothing in the immediate vicinity, so not really very convenient. 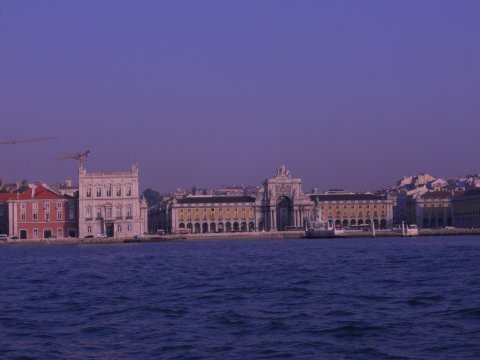 Lisbon was looking increasingly likely, but we pressed on to Lagos anyway. 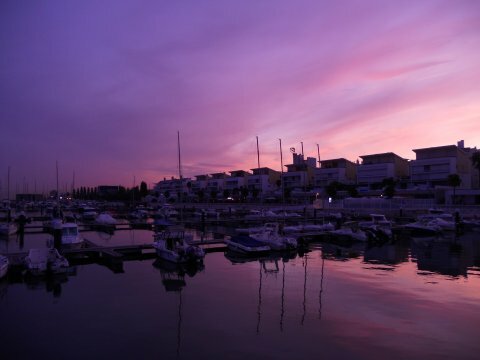 This was a great improvement, but it was getting late, and we didn't really look beyond the marina itself. 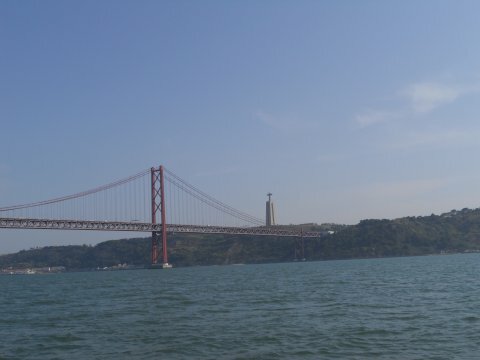 We returned to Lisbon still undecided, completing a 700km daytrip, which included driving across both the Lisbon suspension bridges. The next day we found more information on the web about Lagos, including this excellent website. 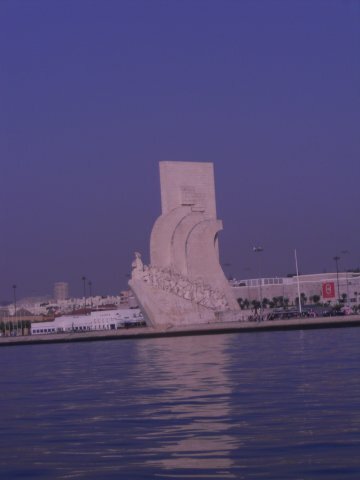 A couple of emails to Terry later and we were convinced that, nice as Parque das Nacoes was, Lagos was for us, so we started looking at the weather forecast. We would have liked to have done the trip in two hops, stopping at Sines, but this would have meant being close inshore in darkness (only 12 hours of daylight now), not a navigational problem but a pot-spotting problem. There was also a perfect weather window on Wednesday/Thursday to make the 120 mile passage in one go before some southerly winds and then bad weather arrive at the weekend, so this is what we planned. Carlos returned on Monday with the plotter complete with new glass. The scratch was unfortunate, but the service we had from NautiRadar was excellent. The contact there is Sonia, who speaks perfect English. 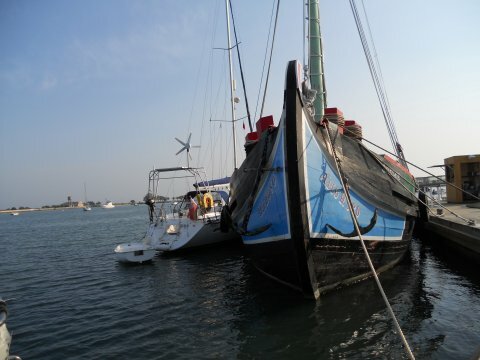 So on Tuesday, with mixed feelings we left Parque das Nacoes and headed for the anchorage at Cascais, from where we would set sail for Lagos on Wednesday afternoon. 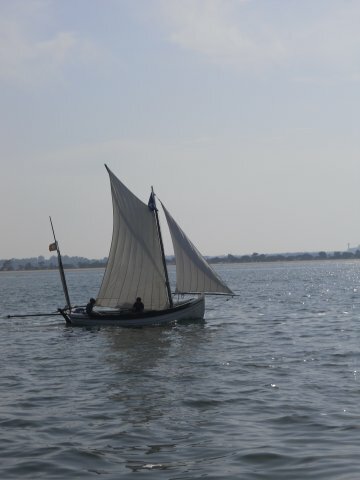 We had a lovely trip down the Tagus on 3 knots of ebb, and sailed for the last hour. 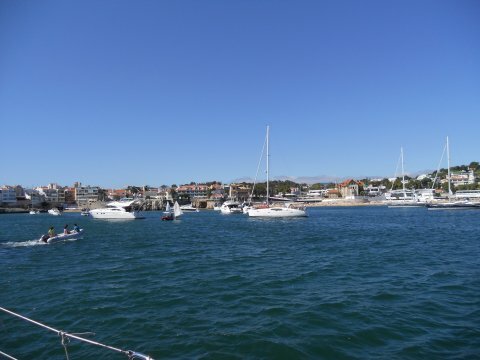 The anchorage at Cascais was a bit rolly and, as we wanted to get a good night's sleep without listening to the anchor chain grumbling, we decided to spend the night in the marina. Three weeks ago when we were here the price for one night started with a 4, now it started with a 1 - it's amazing how that kind of thing colours your view of a place - and we still got another free 'welcome to Cascais' bottle of wine even though they knew we'd been there before! 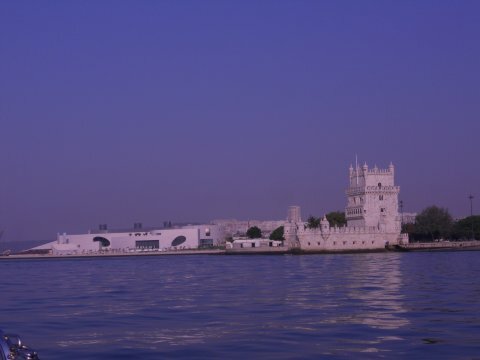 Views of Lisbon from the Tagus. We went for a drink at Skipper Bar, but when the wind became a bit chilly we moved inside and spotted the prawns in garlic on the blackboard, highly recommended by Rob & Rhian, which of course we then had to order - delicious!